"The World of Krypton" - Part 3: "Darkest Depths"
Hector Hammond is floating outside of an H.I.V.E. World Crusher that is in orbit over Earth when Straith, first Knight of the Pax Galactica suddenly teleports in. The H.I.V.E. agents rush to engage him but Hammond tells them to stand down and that he will take care of the interloper. Hammond's insults fall on deaf ears as Straith destroys the World Crusher. The H.I.V.E. agents manage to get Hammond to safety but swear to return and bring all of their resources to bear to destroy Straith. Meanwhile Clark Kent and Cat Grant attend a movie premiere. Clark is concerned at the amount of money they are spending since their website is still in the start-up phase which leads Cat to accuse him of wanting to go back to the Planet. As Cat tries to secure an interview with one of the stars of the movie Clark catches the scent of Infinitium, which is supposed to be secured in his Fortress. When Sir Harlan Quint enters the premiere Clark uses his x-ray vision and discovers that Quint is some sort of android. Before he can spend too much time wondering what is up with that Clark picks up a mental distress call that Hector Hammond is sending out for Superman. Soon Clark has changed to Superman and is in orbit over Earth. Hammond prods him into confronting Straith and things escalate quickly from words to battle as Straith knocks the Man of Steel off of the Moon. Superman chides himself for trying to talk things out first and in short order he is back on the Moon fighting with Straith. The battle turns in Straith's favor but before the fight can continue Lourdes, also of the Pax Galactica, arrives and tells Straith that the time for fighting amongst themselves is over. A threat greater than they have ever faced is waiting in the wings...a threat known as the Lexus. 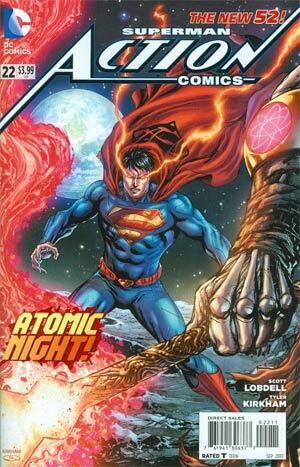 Story - 3: This was a pretty average Superman story. It wasn't terrible but it wasn't the best I have ever read either. Scott Lobdell continues to be a puzzle to me as a Superman writer. On one hand he obviously likes the character and wants to tell fun and exciting stories about him. On the other hand I think that his take on the Man of Steel is a bit off. It makes for a bi-polar reading experience but more often than not I end up enjoying myself. I am a few months behind in my SUPERMAN reading so I am not up to speed on how the whole Hector Hammond/Superman thing. Lobdell seems to like the character and he certainly is doing a much better job with him than Geoff Johns did. I like Johns but his Hector Hammond was way too creepy for my tastes. The Hammond presented here is arrogant and wants to take care of whatever problem that is thrown his way alone but is not above taking help when he absolutely has to. It made the opening sequence fun to read and was a strong way to start the issue. The Clark and Cat scene was enjoyable as well. I am not sure that I like the idea of Clark writing for a website he and Cat run but it seems like a 21st Century take on the idea that Clark is not a reporter for the Daily Planet anymore. They did this in 1971 when Julius Schwartz took over as editor and made Clark a television newsman instead of a print reporter. My gut tells me this whole Cat/Clark thing will play out for a while and then things will go back to the status quo, probably after Lobdell takes his leave of the character. Not that I want him to. Frankly it is nice to have a writer stick around for longer than six issues. The fact that this story takes place in the same time period as SUPERMAN also served to make this issue more enjoyable. It was the first time since this title began that I have felt plugged into the larger world of Superman. So when you add that to the mystery of the android actor and the playful interaction between Cat and Clark this issue is really firing on all cylinders. The problems come with the back half of the story. Again this could be my ignorance of how Superman and Hammond relate to one another but it seems weird that Superman would just blindly check out whatever Hector wants him to check out. Hammond is a super-villain that has some history with Green Lantern. To me Superman should be more suspicious of Hammond's motives. I was also a little uncomfortable with Superman thinking that for once he should just fly into a situation fists first and start with the hitting right off the bat instead of trying to reason with whoever he is confronting. After some thought I took this as Superman being frustrated with the situation and doing what a lot of us do when our usual actions lead to the usual results. It made Superman a little more human and I actually ended up liking that bit of internal dialogue even if I still thought that he shouldn't be in the situation in the first place. The cliffhanger ending wasn't as exciting as I think it was meant to be. I get that this is supposed to be an action driven story (which is fitting given the book's title) but I am really not getting the sense that bad things are on their way. Lobdell failed to sell this aspect of the story because he never showed us what that danger was. He just had two people show up, announce they are part of some galactic federation and that a bad guy named after a high end automobile made by Toyota is a comin'. Maybe if we had seen this danger or if the characters warning us of its upcoming arrival did little more than fight and fight and fight and fight and pose I'd be a little more invested but as it stands I am curious how things will resolve but not jumping up and down with anticipation of the next issue. Art - 4: The art was really solid this time out. Tyler Kirkham has that slick, clean style that I like so much. He also has a strong visual sense and knows when to go big for the action scenes and when to focus in on the smaller details, like at the premiere Clark and Cat attend. His first full shot of Superman was fantastic and while the back half of this story was heavy on the action at least it was good looking action. In all honesty I think Kirkham should be given a Superman title full time but if this story is all I am going to get for the moment then I will enjoy it while I have the chance. The soldiers that have surrounded Jor-El and his team demand that he surrender. Jor-El ejects from his underwater suit which causes the Teklons to become agitated. They attack the soldiers and give him and his team the chance to escape. Meanwhile the Colonel interrogates the surviving members of the Science Council. His goal; to find out the true purpose of a machine one of the council members claims is part of the power grid. After that Councilor is killed another, Kra-Hu, explains that it is a Sensory Harmonic Resonator but the only man that knows the machine's protocols is Jor-El. The Colonel reveals that he knows that the machine has been used to keep the Council members intellectually curious while keeping the populace in a peaceful state but that is about to change. Jor-El regains consciousness just in time to have another squadron of soldiers want to take him and his people into custody. Lara arrives and rescues them. As they race back to the Council Jor-El and Lara bicker but eventually agree to work together since they have both taken an oath to protect Krypton. At that moment the Colonel activates the machine, which he has changed to cause the people of Krypton to obey him without question. Kra-Hu accuses him of being insane but the Colonel replies that he has never been saner in his life and that there is no question to the righteousness of his cause. He acts in the name of Krypton, its lost people and for...THE ERADICATOR. Story - 4: The quality of writing in this back up gets better with each installment. This chapter had more meat on the bone than the previous one, which made for a more enjoyable read. Jor-El, Scientist of Action continues to be a lot of fun and while the banter he has with Lara could be a little stronger it is good seeing the two characters working together. The Colonel is a rather one note villain but he is an enjoyable one note villain, at least for the moment. I have to admit that the real turning point for me and this story was the mention of the Eradicator on the last page. While part of me is afraid that the creators are going to take an idea and character I liked quite a bit before the New 52 erased that continuity and just ruin it I will remain open minded to what they have in store. Who knows? It could be awesome. Weirder things have happened. Art - 4: Again the art is what really sells the story here. I continue to love the look and feel of Krypton. Derenick takes us from the depths of the ocean to the hall of the Science Council and doesn't miss a beat in between. The action is intense but not at the expense of the storytelling. The final page felt a little too much like a pin-up but it sold the cliffhanger ending just fine. No complaints here. 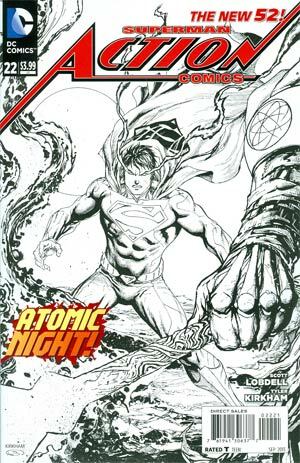 Cover Art - 3: The reason this cover gets a three out of me is because of the Glowing Angry Red Eyes of Anger motif that has been dogging Superman for years now. I know I complain about this a lot but it has become such a tired clich� that has lost all of its effectiveness. The cover is just fine without it actually but the fact that they are there bugs me to no end. Variant Cover Art - 3: This cover made me appreciate the detail put into Straith's gauntlet and weapons but the Glowing Angry Red Eyes of Anger look even worse when they are the Angry Black and White Eyes of Anger. Again, this isn't a bad cover but that one detail just about ruins it for me.